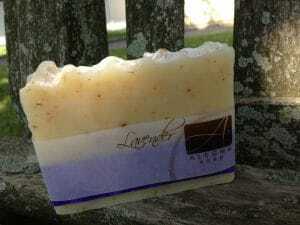 Since I spend a lot of time with my soaps, I think of them as my friends. I give them different personalities and I thought you may like to see them the way I do. 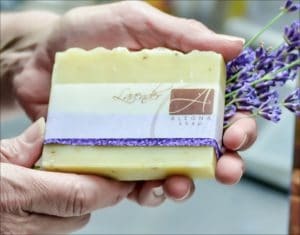 Meet Victoria, my Lavender soap. Tying up her hair to put on a touch of mascara and blush before slipping into a crisply pressed navy-and-white-striped button-down shirt and white pants, Victoria checks her watch. “I can’t be late for lunch, and I need to stop for a small gift on the way”, she tells herself, preparing to meet her best friend for a quick bite to eat at their favorite East-Side bistro. As she steps into her Rothy flats, this tastefully tailored doyenne makes sure to check her phone before placing it snugly into a pocket in her red leather bag. Always well-put-together and right on time, Victoria peeks at the mirror for a quick once-over. “Hmmm. A little gray coming through”, she notes, glancing at her hair, but she’s comfortable with that sign of being a woman experienced enough to know just what to do and when to do it. Closing the door to her Upper West Side brownstone behind her, she descends the front steps just as her Uber driver pulls up. 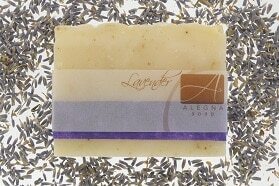 As she climbs in the car she tells him to stop at the boutique where she has discovered a favorite handmade Lavender soap. There’s a reason she’s stress-free. Always plan ahead, a time and a place for everything, take care of your friends, and take good care of yourself. The shop already knows she is on her way, and the packages will we wrapped and ready. For her friend, a gift basket of delicately scented scrubs, and for herself, the prospect of a lavender-lathered soap in the old claw foot tub later that evening surrounded by candles and the soothing sound of Bach – just the thing to maintain her even keel – and no one need be the wiser. I hope you love Victoria as much as I do. Of course it is hard to pick a favorite when you are a master at making all of your creations. With many thanks and love.